Garmin Forerunner 35 helps you stay fit and connected. It’s a lightweight, easy-to-use GPS running watch with Garmin Elevate wrist-based heart rate, giving you the option to run without a chest strap. Forerunner 35 includes smart connectivity, various sport profiles and useful features such as auto pause and run/walk activity mode. Garmin Forerunner 35 is specifically designed for entry-level runners and those who still want or need the latest GPS technology. It has all the best features of the earlier models and adds Garmin’s own wrist-based heart rate technology. Heart rate is the same as used on advanced models including Forerunner 235 and 735XT. You may be interested in our review of the new Garmin Forerunner 645 Music. Garmin Forerunner 35 has the essential running watch features that you need, including time, distance and pace. Among the standard features there are few new ones. Vibration alerts for running prompts to help keep you on track, activity tracking milestones (for example goal met), and virtual pacing progress. Vibration alerts can be customized to your individual requirements. Other running watch features include an Interval Timer, Auto Lap, Manual Lap, Auto Pause, Audio Prompts, alerts for Time, Distance, Calories, Heart Rate and Music Controls. 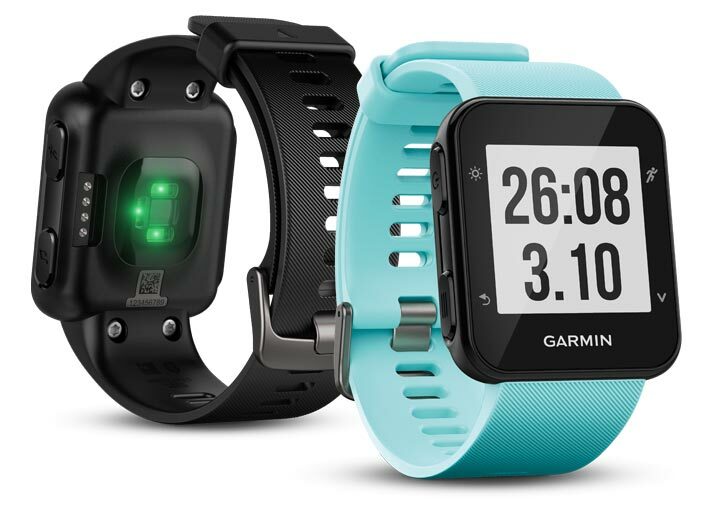 Garmin Forerunner 35 wirelessly automatic uploads to Garmin Connect and smart notifications are now standard across the Forerunner range. When Forerunner 35 is connected to a modern smartphone via Bluetooth, it will display calls, texts, emails and social media alerts. This is a useful feature although can be distracting if you decide to wear it as an everyday watch. Another useful and potentially safety feature is LiveTrack. When running you can send your activity to friends or family for real-time tracking. With the link to your activity, they can see where you are on a map and data about your run. Your phone must be in signal range for this to work (strapped to your arm for example). Data fields on the new Forerunner 35 can be customized so you can see the data you need at a glance. You can also use Forerunner 35 when cycling to monitor pedaling cadence and speed (additional sensors required). Other activity profiles include run/walk, indoor/outdoor running, and cardio.24/7 activity tracking is now standard in all Garmin watches. If you decide to wear Forerunner 35 daily you can track your steps, distance, calories burned and sleep. A move bar appears on the display and reminds you when it’s time to move. You can also work towards perzonalised daily step goals for extra motivation. Garmin has worked hard to improve the look of their sport watches recently, and even the high-end versions look like they should be sitting next to Tag Heuer on the display shelf. The Forerunner 35 is no exception and is a significant step forwards in entry-level running watch design. Garmin have opted for square display with nicely rounded corners, moving away from the round face we usually see. The strap comes in a variety of bright colors while the main display and watch face remains in black. The silicone molded band has a criss-cross pattern that Garmin has been using on other products such as the Vivoactive HR GPS smartwatch. It’s lightweight (37.3g / 1.3 oz) and comfortable to wear all day. The watch face has 4 physical buttons, 2 either side of the rounded display. From top left to bottom right – power and backlight, return to the previous screen, start/stop activity and menu down. This is a running watch with simplicity in mind, the screen looks easy to read with large digits allowing you to view data at a glance. Garmin states the display has been updated with a better contrast, although pixels are the same in comparison to the earlier Forerunner 25 (128×128 pixels), and it’s still in black and white. Previous watches with wrist-based heart rate left a small indentation in your wrist after wearing. This is because the area at the back of the watch which measures heart rate is a slightly raised bump. This watch is more streamlined as the technology improves. The Forerunner 35 is smoother and far less protruding. This latest edition to the Forerunner range strengthens Garmin’s position as the clear market leader in GPS running watches. Bringing wrist heart rate to a budget-friendly watch has made this appealing to casual runners who still want the latest wearable tech. The Forerunner 35 should be a popular choice among runners.